The Town of Cicero officially cut the ribbon on a new park and state-of-the-art animal shelter at 18th and Laramie during ceremonies attended by more than 200 area residents on September 15th. The new Cicero Campus Park will showcase the town’s new Animal Shelter which also features three dog parks and walking trails for Cicero families with their pets. 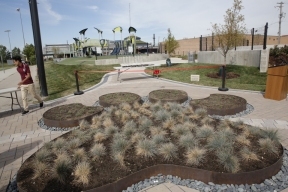 The Cicero Campus Park features a skate board tube, new children’s playground equipment, a sand volley board court, bean bag courts, a gazebo and rest area, and outdoor health and exercise equipment. The new animal shelter is located adjacent to the existing shelter at 1634 S. Laramie Avenue. Waggin’ Tails Animal Shelter was first opened in 2007 in response to a growing need for animal care. The new building is slightly larger than the existing animal shelter, about 6,500 square feet. It includes separate staging areas for new dogs and new cats that are brought into the shelter for the first time. The new Waggin’s Tails building will be in full operation by October 1 and open to the public on October 1st. 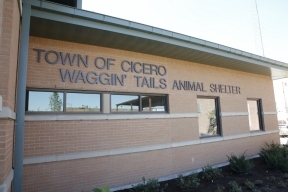 For more information on the new Waggin’ Tails Shelter and for information on the shelter’s services, please visit the Town’s website at www.TheTownofCicero.com.